To get the tattoo, Johnny lies back in a chair, and a technician of some sort works briefly at waist-high controls beneath a nearby screen. Then the technician walks away while Johnny’s tattoo is burned with blue lasers onto his arm. 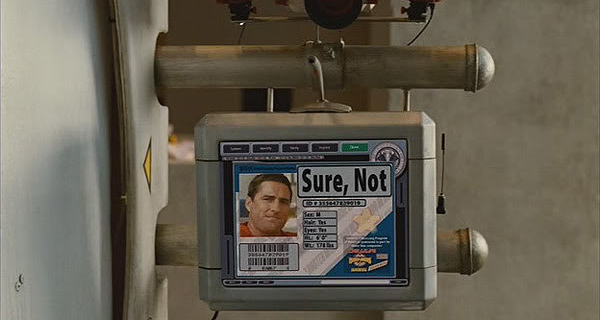 At the upper left corner of the screen a display reads SELECTED above the image being burned into Rico’s arm. (With white indicating no color.) Beneath it, is a square divided into four quadrants is filled with unintelligible numbers scrolling along, above the words AUTOMATIC SEQUENCE CONTROL. Down the center of the screen beneath the word LASERS is a column filled with boxes showing sine waves and their corresponding frequencies from the shorter blue wavelengths moving down to yellow, red, and finally a double-lined white waveform. At the right of the screen is a large screen-green rectangular grid on which the selected pattern wipes in from top to bottom as the corners blink in red and yellow. There are two main problems that are apparent in the scene. What does the technician do? Essentially, he presses a button and then walks away. Even as Johnny’s friends rush him out of the room in celebration, no one stops them to pay, which seem to indicate that everything has already been taken care of before he sits in the chair. Also, we notice that Johnny’s arm has not been strapped down, wrapped in healing bandages, or secured in any way. He stays relatively still throughout the procedure, but it seems a safe assumption that not all customers will be stoic soldier types who are able to sit still while their arm is literally charred by lasers in front of their own eyes. The machine must be able to compensate for movement, either by adjusting the lasers or shutting off completely, so, again, no technician is necessary. Also, when a fellow roughneck pours liquor over Johnny’s arm while his skin is in the process of being vaporized by lasers, the liquor doesn’t ignite in a horrifying fireball as we might expect, indicating that the lasers must have scaled back their intensity just in the nick of time—this is a pretty context-aware system with a lot of built-in error correction. Maybe they’re there for insurance purposes but given what we see in the scene, they serve no real purpose. Assuming the Death from Above design was one already in the machine, he could have completed the entire transaction himself from start to liquor-soaked finish. As the image of the selected design scans into view on the right side of the screen, we can see that there is no exact correlation between the parts of the image on screen, and the parts of the image on-skin. The wireframe wipes in from top-to-bottom. The tattoo is finishing up in the middle. The tattoo is already 90% complete when the animation begins. The blinking numbers, the wiggling sine waves. It doesn’t mean anything and isn’t useful. So all told, the information on the screen initially appears complex, but given the total automation of the system it’s actually quite simple: Here’s what’s happening, and here’s the progress. Maybe it’s not for the technician at all. You can imagine that while having your skin seared by painful, painful lasers, all that fuigetry would be a welcome distraction, and a progress bar would be a welcome reassurance that it won’t last forever. With this in mind, the main problem with the screen is that it should be facing the customer, who is the real user. This entry was posted in Starship Troopers (1997), ~ scifianimatedgifs and tagged apologetics, cosmetic surgery, eurostile, lasers, primary colors, purple, screen green, tattoo, wireframe. Bookmark the permalink.